Pandan Chicken flavor profile vary depending on whether it's a Thai, Vietnamese or Malaysian recipe. 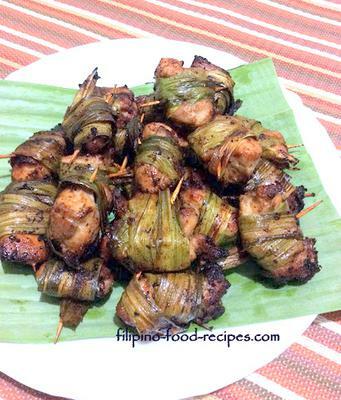 The basic premise is it's a seasoned chicken with pandan leaf wrapped around it, and then fried. This is one of my kids' favorite -- the sweet, fragrant aroma of the leaves wafting in the kitchen as I cook that they could hardly wait. For this recipe, I seasoned the chicken with oyster sauce, liquid seasoning, garlic , ginger and coconut powder. 1. Marinate chicken in oyster sauce, liquid seasoning, garlic, ginger and gata powder overnight. 2. Tie the pandan leaves around each piece.